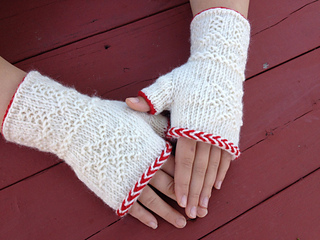 These warm and cozy fingerless mitts are a wonderful way to introduce yourself to the fascinating Swedish technique Tvåändsstickning, or Two-End knitting, aka twined knitting. 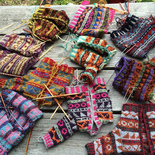 You will learn yarn management, a twined knitting cast-on, the basics (knit and purl), and a selection of motifs. 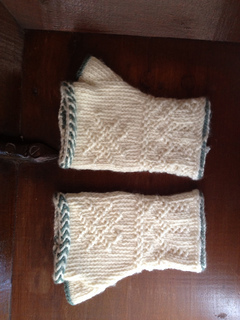 In addition, you’ll learn to read a twined knitting chart and work the Crooked Thumb Gusset by increasing in twined knitting. Finish off with the Herringbone Braid at the top! 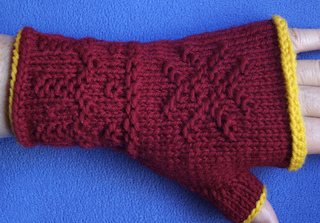 These mitts use a few yards of a second color for the cast-on, the Herringbone Braid, and the edge of the thumb. The information is organized into Technique Boxes and Theory Boxes with accompanying photos. In addition to charts and a schematic, there is a suggested reading list and list of abbreviations. You can purchase a kit for this pattern in Beth’s Etsy shop.